I am writing to ask you to attend our Annual Congregational Meeting for 2017 to be held on Sunday, January 29 at 10am. Below you will find the full schedule of information sessions giving you the opportunity to learn more about our ministry and our budget, which will also be available on the website as of January 19th. There will not be time at the annual meeting for a thorough discussion of our programs or the budget, so we urge to attend the preceding information sessions to get informed, ask questions, and discuss our ministry and proposed 2017 budget. Annual reports from the Congregation Council and all other ministries and committees are now available on our website to share with you the incredible work that our pastors, staff, and lay volunteers have been doing all year to create the worship, programming, ministries, and behind the scenes support that makes Advent a place of worship and joyful community. Printed copies of annual reports will be available starting this Sunday, January 8. Advent is at a time of transition and anticipation as we await the call of our new pastor. The Call Committee has been working extremely diligently to bring forward the name of a pastor who will lead us in our love of Jesus, inspire us, innovate programming and outreach, and ensure the closeness and perpetuity of our church community. This is a tall order, which the committee takes very seriously. To protect the confidentiality of a prospective pastor, the Call Committee is not able to share many details during the process, but once a candidate is identified and recommended by the Council, the congregation will have the opportunity to hear the candidate preach and then to vote on whether or not to call the pastor to Advent. In the meantime, I encourage you to be active in your membership at Advent by coming to church regularly, sharing in worship and fellowship with other members. This is the way that we will keep our momentum going and our faith strong during this interim period. I look forward to seeing you on Sunday, January 29th at 10am and at the information sessions during the preceding weeks. Please come share your questions, insights, and passion for our mission and ministry at these important meetings in January. Programs Meeting on Sunday, January 15 | 10am in the basement fellowship hall. Learn about, ask questions, and discuss our ministry and staff reports. Finance Meeting on Sunday, January 22 | 10am and 12pm in the basement fellowship hall. Learn about, ask questions, and discuss our proposed 2017 budget and other financial matters. Annual Congregational Meeting with Vote on Sunday, January 29 | 10am in English and Spanish in the basement fellowship hall. Our formal meeting for a congregational vote on the 2017 budget, called leaders, Council members, and other action items. We've prepared a comprehensive collection of Annual Reports from the Congregation Council, Call Committee, and over 40 more committees, task forces, ministry leaders, and staff. We are proud of and grateful for the vastness and diversity of our ministry, but we know it also makes for a lot to read through, which is why we're providing all 2016 Annual Reports on our website and in print here at Advent throughout the month of January. We invite you to start reading our Annual Reports on our website today in preparation for these important meetings. As we seek to be environmentally conscious while ensuring information is accessible to everyone, we will have a limited number of printed annual reports available beginning this Sunday, January 8. Keep your eye out for special articles and stories about our ministries in our upcoming weekly e-letters, as we seek to inform you about our growing ministry and call you to engage in our Programs Meeting on January 15th, Finance Meeting on January 22, and Annual Congregational Meeting on January 29. Any Questions about the Annual Meeting? We are striving to be as clear, transparent, and comprehensive as possible in bringing you news about this year's Annual Congregational Meetings and Annual Reports. If anything is unclear, or you have any questions about the meeting, please let us know! We'd be happy to clear it up for you, and you might identify something helpful for us to share with the whole congregation. Ask a question by clicking the button below, replying to this email, or sending an email anytime to communications@adventnyc.org . Thank you for your engagement and support as we gather together for these important meetings. The festivity of the season is not quite over yet! Join us for our Three Kings Celebration at 12pm this Sunday, January 8! This is an awesome opportunity for our English-worshiping families and Spanish-worshiping families to celebrate part of the Christmas story together, so come take part! The Three Kings Celebration is a tradition in many Latino cultures, and Three Kings Day is a festival Sunday for all Lutherans. Here at Advent, our Three Kings Celebration includes a big potluck lunch for all, a piñata filled with candy for the kids, a special cake, the singing of traditional songs, and a visit from the three kings (yes, we've got the costumes). It's going to be a lot of fun. Come join us! 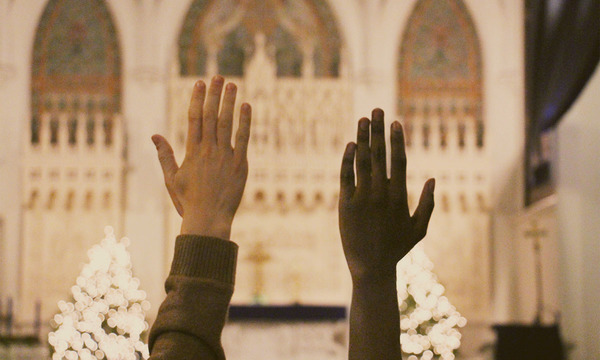 How can we be not only a diverse congregation, but an actively anti-racist congregation? Join us for an engaging conversation and soup lunch at 12pm Sunday, January 15, where we'll explore hidden frameworks of institutionalized racism, and seek to become more inclusive and actively anti-racist as a congregation. This important conversation will be facilitated by Pastor Charles Miller, who along with others in our congregation attended the Anti-Racism Introductory Training seminar held by the Metropolitan New York Synod in August. This conversation will coincide with the soup lunch preceding the Morgan Library trip (described below in the "Celebrating 500" article). You’re invited to join the trip to see the Reformation exhibit at the Morgan Library immediately after this too, or to attend just the conversation -- whichever you prefer! Our Wednesday Evening worship services will continue at 6:30pm on January 4 and January 11. Hear two more reflections from Advent leaders on Martin Luther's Christmas Book, and sing music from Holden Evening Prayer at these candlelight evening services. Reflections will be by Deacon Ross Murray about The Three Wise Men on January 4, and by Kevin Bowen about The Presentation on January 11. Come support these leaders in worship with us. We have two more Community Gatherings post-election and pre-inauguration. You’re invited to join us in sharing, praying, and strategizing advocacy action Wednesday evenings from 7:30-8:30pm on January 4 and January 11. On January 11, a special guest from the Interfaith Center of New York will join us to share information about supportive actions we can take with the Muslim community in NYC. As we celebrate the 500th anniversary of the Reformation, join us for a broad array of special events in January and February. Trip to the Reformation exhibit at the Morgan Library | On Sunday, January 15 join us on a trip to the Morgan Library downtown to see their Reformation exhibit, featuring an original, authentic copy of the 95 Theses! 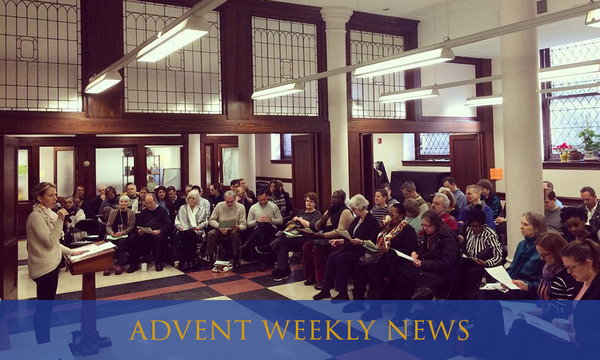 We'll meet at Advent at 12pm for a soup lunch, and depart for the library around 1:30pm. "Forgotten Luther" Book Study | Join us at 6:30pm Wednesdays January 25, February 1, and February 8 for a study on the book "Forgotten Luther," which focuses on the social justice aspect of Luther's theology. Books are available now in the office! Pick up yours today, and join us for this special study led by Pastor Sudbrock. Small Catechism Study | Pastor Sudbrock will also lead a 4-week study of Luther's Small Catechism during our Adult Conversation hour at 10:10am Sunday morning in the basement fellowship hall during the month of February. Reformation Hymn Sing | At 6:30pm Wednesday, February 22, join us for a special service of singing awesome hymns, old and new, that continue to bring the Lutheran church to renewed life. What ministry or group will you be involved in this month? There are even more ways to connect in fellowship and service this January!